It doesn’t take a time machine to visit the past in Middle Georgia. It takes a few hours, a tank of gas and the willingness to ramble around a bit. Within easy driving distance -- and often without an admission price -- historic sites, museums and other attractions can provide glimpses into the worlds of Native Americans, kings of railroads and rock ’n’ roll, farmers, warriors, writers and others who made our communities and lives what they are today. And maybe some entertainment and a little exercise to boot. Here are examples of must-see attractions in eight midstate counties plus suggestions for a handful of other things to see and do -- and eat -- while you’re there. The past is in just about any direction you choose. Biggest draw: Ocmulgee National Monument, 1207 Emery Highway, Macon, 478-752-8257, www.nps.gov/ocmu. You can wander Macon’s modern parks, neighborhoods, shops and places of worship, or you can visit Ocmulgee National Monument and stroll similar paths once taken by Ice Age hunters, Native Americans, American colonists, Civil War fighters and others through the centuries. In fact, Ocmulgee National Monument’s 702 acres are touted as having been continuously inhabited by humans for 17,000 years. According to Valerie Bradley, director of communications for the Macon-Bibb County Convention & Visitors Bureau, they’re Macon’s No. 1 tourist destination. The historic National Park has the continent’s only restored Native American earth mound, one of the park’s seven mounds and the tallest at 55 feet. Within is a fire pit surrounded by 47 molded seats on an eagle floor platform. The floor was carbon dated to 1015. The park’s museum displays more than 2,000 artifacts. A gift shop sells pottery replicas, jewelry inspired by former inhabitants, clay for Native American craftmaking and books about history. The park has spots for picnicking and six miles of trails for walking, hiking and bicycling through the mounds, historic village sites, grass fields and woodlands. An 800-foot boardwalk also allows access to wetlands. In addition, Ocmulgee National Monument offers a surprising variety of activities for young and old, including tours, regularly scheduled craft days for kids and occasional outdoor movie nights. Plus, there are annual events and celebrations like the Ocmulgee Indian Celebration, held annually the third weekend in September. The next outdoor move is happening Oct. 23. Ocmulgee National Monument is open 9 a.m.-5 p.m. daily except Christmas and New Year’s Day. There is no entry fee except for occasional celebrations and certain special events. Drive by or visit Fort Hawkins on Emery Highway at Maynard Street. A U.S. Army Fort and Indian Factory for trading established by President Thomas Jefferson and Indian Agent Col. Benjamin Hawkins in 1896, it overlooks the “Indian mounds.” It’s called Macon’s birthplace. See or tour Macon’s Hay House at 934 Georgia Ave., 478-742-8155, www.hayhousemacon.org. It’s an 18,000-square-foot historic Italian Renaissance Revivalstyle mansion completed in 1859 containing opulent décor and advanced features like hot and cold running water, central heat, an in-house kitchen and elaborate ventilation. It’s now a museum and available for event rental. Catch The Allman Brothers Band Museum at The Big House, 2321 Vineville Ave., 478-741-5551, www.thebighousemuseum.com. The mansion was home to and the gathering place for Allman Brothers Band members, families and friends and now features memorabilia of the musicians and era that gave rise to Southern rock. The Big House is also a popular music and event venue. Stop by the Otis Redding statue at Gateway Park at Martin Luther King Jr. Boulevard and Riverside Drive. It honors Macon singer-songwriter Otis Redding who died in a plane crash in 1967 just before his most famous song, “Sittin’ on the Dock of the Bay,” hit No. 1 on the charts. Tour the Tubman Museum, 310 Cherry St., 478-743-8544, www.tubmanmuseum.com. Established in 1981, the Tubman Museum is dedicated to teaching all aspects of the art, history and culture of African Americans. Biggest draw: The Museum of Aviation, Ga. 247 and Russell Parkway, Warner Robins, 478-926-6870, www.museumofaviation.org. One of the country’s leading aerospace museums is in Warner Robins just south of Robins Air Force Base. For 30 years, the museum has showcased a growing outdoor display of aircraft on its 51-acre site and presented indoor aircraft and historic memorabilia in five main buildings boasting 200,000 square feet of exhibit and educational classroom space. Today, about 90 aircraft are displayed. The latest addition to the collection is a B-17 bomber undergoing restoration -- one of only 50 of the famed World War I bombers left. A few of the other aircraft include B-29, B-52 and B-1B bombers; C-46, KC-97, C-130 Hercules and C-141 Starlifter cargo planes (and a C-54 used in the Berlin Airlift); a large number of fighter aircraft including a P-40, F-100, F-15 and an F-4D, which recorded two MiG kills in Vietnam plus an Air Force Thunderbirds F-16. Displays also include helicopters, trainers and utility aircraft as well as aircraft with fuselages and cockpits open to the public. There’s also the SR-71 spy plane, which set a speed record in 1976 that it still holds today: 2,193 mph. Beside the aircraft themselves, the museum tells the Air Force story through other means from its earliest days and conflicts to more modern times. Officials say most visited at the museum is the WWII building with numerous exhibits including the story of WWII ace, Brig. Gen Robert L. “God Is My Co-Pilot” Scott; the 507th Parachute Infantry Regiment and the air invasion of Normandy; “Hump” pilots of WWII’s China-Burma-India Theater; and one of the country’s most extensive exhibits on the Tuskegee Airman, a group of black fighter and bomber pilots. The museum is also home to the Georgia Aviation Hall of Fame. It’s also an educational center stressing science, technology, engineering and math subjects through programs like STARBASE Robins, the Middle Georgia Youth Science and Technology Center, STEM Training Academy for Teachers and a variety of summer youth camps and academies. Visitors can enjoy the museum’s café, gift shop and take part in annual events such as a car show, model plane and train show, model contest and a marathon, half-marathon and 5K run/walk. The museum is free and open from 9 a.m.-5 p.m. daily, except Christmas and New Year’s Eve. It’s closed Easter, Thanksgiving, Christmas and New Year’s Day. Tour Depot Row at the Warner Robins Convention & Visitors Bureau and Visitor Center at 99 N. Armed Forces Blvd. in Warner Robins, 478-922-5100, www.warnerrobinsvisitorscenter.com. It’s a “collection” of train depots, one of which is the Warner Robins visitor’s center. Others serve as an historic center, another a replica country store and another as the Elberta heritage center. Eat a meal at Owens Boarding House restaurant at 106 Young Ave., Warner Robins, 478-923-9108. The long-time boarding house/restaurant dates to Warner Robins’ early days and features Southern home-style cooking served at long, shared tables. Go weekdays from 11 a.m.-1 p.m. Enjoy a tour of the Perry Area Historical Society Museum at 901 Northside Drive, 478-224-4442, www.perryhistoricalsociety.org. There are extensive displays of Houston County historical memorabilia, archives and genealogical material tracing the history of the land, structures and people of Houston County. www.perryhistoricalsociety.org/events. It’s the last of what was once more than 50 one-room school houses in Houston County, built in 1905 three miles north of Perry and now restored. Eat lunch or dinner at The Swanson House restaurant at 933 Carroll St., Perry, 478-987-1938, www.theswanson.com/aboutSwanson. There’s classic Southern food served in historic surroundings. The Swanson house history reaches back to the late 1700s. Biggest draw: Fort Valley State University, 1005 State University Drive, 478-827-3878, www.fvsu.edu. Founded in 1895 as Fort Valley High and Industrial School, Fort Valley State University is the single remaining Georgia 1890 land-grant school and one of only three public historically black colleges and universities in the state. The school became Fort Valley State College and part of the University System of Georgia in 1939. Visitors to the campus can find a mix of buildings and architectural styles from the early 1900s to modern times and should look for the historical Horace Mann Bond Building, an early building at the university. There’s also Founder’s Hall and a visit to the old FVSU gym, Woodward gym, will provide the opportunity to see team photos and other memorabilia from days past. One of the new generation at FVSU, senior Ryan Taylor, a social work major and veteran athlete, said he’s proud of the school’s heritage of hard work and achievement, which has inspired him. He said ask anyone on campus to point out the school’s early traditional dorms, no longer in use but still standing. While on campus, keep an eye out too for building names and you’ll recognized prominent early 1900s philanthropists who helped the school become what it is - - like on the Carnegie Library. Also, across from FVSU to the west, notice the 75-year-old St. Luke’s Episcopal Church. The parish and FVSU’s histories are intertwined -- even at one time sharing property -- through the church’s original support of the school beginning in 1913. Among other things, church backing allowed the building of Ohio Hall, named in reference to the Episcopal Diocese of the State of Ohio. Stroll through Massee Lane Gardens, the historic Headquarters of the American Camellia Society at 100 Massee Lane just south of Fort valley, 478-967-2358, www.americancamellias.com. Masse Lane Gardens has numerous themed gardens and extensive paths. Ramble through Anthoine Machine Works at 311 West Railroad St., Fort Valley, 478-825-5613. Anthoine’s is a still-operating machine shop making custom parts since 1885 when it was opened by Henry C. Harris to serve the railroad and local farming and industrial clients. It’s a living museum -- and you can even order a special-made part for something-or-another if you need to. Visit a spell at the Powersville Opry off Ga. 247 Connector east of Interstate 75 on Powersville Road, 478-953-1406, www.powersvilleopry.net. The building was Powersville’s first post office, later a country store and now an opry house in the musical tradition reaching to the early 1900s. Saturdays feature gospel, country and bluegrass music. Visit Byron’s downtown historic district around Main Street where you can see the old Byron Train Depot Museum tracing the community’s history back to the 1800s. Walk a few steps one way and see the old jail built in 1875. A few steps the other way reveals homes of the era. Stop and read the historic marker on U.S. 41 just south of its intersection with Ga. 49 commemorating the 1970 Second Atlanta Pop Festival, also known as the Byron pop festival, which overran the Middle Georgia Raceway and adjacent fields and woods. It’s considered the largest gathering in Georgia with 250,000 to 500,000 people attending to hear the likes of Jimi Hendrix and the Allman Brothers Band. Biggest draw: Georgia’s Old Capital Museum, 201 East Greene St., Milledgeville, 478-453-1803, www.oldcapitalmuseum.org. Before it moved to Atlanta, the center of Georgia’s state government was in Milledgeville. Milledgeville was literally created to serve as the capital and did so from about 1807 to 1868. Grand buildings were erected and still stand where officials met, discussed and voted on the affairs of state. The story of Milledgeville’s reign as capital, its people and politics, is told through displays at the museum. The institution preserves and showcases the broader historical and cultural heritage of Milledgeville, Baldwin County and Middle Georgia from the days when Native Americans made it home. And why not learn Civil War history in the building where Georgia legislators voted to secede from the Union? The museum is open 10 a.m.-4 p.m. Wednesday-Friday and noon-4 p.m. Saturday. Complete your old capital visit by going to the old governor’s mansion at 120 S. Clarke St., 478-445-4545, www.gcsu.edu/mansion. The mansion was designed in the High Greek Revival architectural style and completed in 1939. Not only did it serve governors, it served as Union Gen. William T. Sherman’s occupied headquarters during his destructive March to the Sea. It’s now an historic house-museum open for tours 10 a.m.-4 p.m. Tuesday-Saturday and 2-4 p.m. Sunday. Visit Andalusia Farm, the home of author Flannery O’Connor, at 2628 North Columbia St., Milledgeville, 478-454-4029, www.ndalusiafarm.org. The famed Georgia author’s home is where she wrote some of her notable works. More than a dusty, bookshelf-lined museum, it has 500-plus acres of rolling hills, a farm complex, hayfields, pastures, ponds and forests. See where classic silent film comedian Oliver Hardy was raised and worked as a projectionist, inspiring him to become an actor. There’s an historic marker at the corner of Greene and Wayne streets in front of the old Milledgeville Hotel where his mother, Emily, was manager. It’s now the Magnolia State Bank. There are many other historic sites and markers to see around the downtown area. Visit Rose Hill-Lockerly Arboretum at 1534 Irwinton Road, Milledgeville, 478-452-2112, www.lockerly.org. This stately home originally built in 1839 that burned and was rebuilt in 1851 is now home to an arboretum that promotes ecological, horticultural and historical education. When open, visitors can walk trails, picnic, watch birds and wildlife, explore the mansion and more. Catch the trolley. 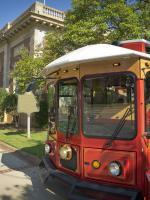 An historic two-and-half-hour guided trolley tour takes in most of the sites. Tours begin at the Convention & Visitors Bureau at 200 West Hancock St., Milledgeville, 800-653-1804, www.visitmilledgeville.org. Biggest draw: The Museum of Southeastern Indians, 779 Julia Jordan Road, Roberta, 478-836-2696.
are thousands of arrowheads, hundreds of pieces of ancient pottery, food preparation utensils, guns, canoes, carved statues and many other relics. School and other groups are welcome to tour the museum, as are families and individuals. All is by appointment only, and all is free -- though donations are readily accepted. The museum is west of Roberta. Travel about eight miles west on U.S. 80 and look for Julia Jordan Road to the left. Follow the arrowhead markers and you’re there. In addition to Native American artifacts, Spokes has barns filled with old farm equipment to view. And while wandering the pleasant museum surroundings, don’t hesitate to take advantage of Spokes’ encyclopedic knowledge of the items he’s collected and the people who used them. That’s a treasure in-and-of itself. Russell Jones, president of the Crawford County Historical Society, highly recommends a visit to the Museum of Southeastern Indians, calling it an unforgettable opportunity to touch the past. He recommends it even though he and the historical society operate their own by-appointment-only pottery museum worth seeing in Knoxville. It’s near the old Crawford County Courthouse. (Contact Jones at 478-781-5777 to see it.) Pottery is big in Crawford: it’s home to the JugFest pottery festival, held annually the third Saturday in May. Drive around the old county courthouse and courthouse square established in 1831 in Knoxville. U.S. 80 makes up part of the square to the north and Ga. 42 to the south. You can make an appointment to see inside by contacting the Crawford County Historical Society at 478-781-5777. Keep an eye out for historical markers and the old jail and the historic Georgia Post newspaper office, all visible nearby. Visit Col. Benjamin Hawkins’ grave about six miles southwest of Roberta off Ga. 128 on Benjamin Hawkins Road. There’s a flagstone marker there. A member of George Washington’s staff through the Revolutionary War, Hawkins was Indian Agent for the Southeast from 1796 to 1816 and settled in Crawford County. There’s also a granite monument to Hawkins in downtown Roberta near the old train depot. Check out Musella, home to Dickey Farms (www.dickeyfarms.com), established in 1897, which operates Georgia’s oldest continuously operating peach packing house, built in 1936. Musella also is home to the Hays General Store, which opened in 1900 and has 110 years of continuous operation, plus Musella Baptist Church, established in 1884 with a building dating to 1908. Biggest draw: Jarrell Plantation Historic Site, 711 Jarrell Plantation Road, Juliette, 478-986-5172, www.gastateparks.org/info/jarrell. In contrast to a “Gone with the Wind” impression of what a Southern plantation was like, the Jarrell Plantation Historic Site takes visitors back in time to a more realistic experience of what life and times were like on a working, middle-class family plantation. The site itself was owned and operated by a single family for more than 140 years before descendants donated it to use as a public historic site 1974. Now, Jarrell Plantation is typically open 9 a.m.-5 p.m. Thursday-Saturday. Those coming are treated to a movie, tours and demonstrations showing how people lived and how things were done in those days. Plantation staff and volunteers take a “re-enactment” approach to telling the past’s story. At Jarrell, there are original and restored houses, barns and work sheds to wander through with many of the furnishings and implements made long ago by residents. There’s often old-time music to enjoy and chores to share. There’s gardening and clean up to do. There’s old-style weaving and craft-making to watch and take part in -- like learning to create a corn-shuck doll. It pays to keep an eye on Jarrell Plantation’s website for events that often coincide with agrarian seasonal cycles -- cycles many are no longer even aware of. There are demonstrations and opportunities for hands-on candle making, sheep shearing, sugar cane grinding, syrup making and more. At Christmas, there’s the opportunity to celebrate like it was the 1890s: natural greenery and homemade decorations plus warm spiced cider. All in all, it can make learning history painless -- and fun. If you’re hungry, or just the sort who stops for barbecue whenever you can, there’s Old Clinton Bar-B-Q at 4214 Gray Highway. It doesn’t go back to real Old Clinton days, but it was featured on TV’s “Dirty Jobs.” Don’t worry, the kitchen and dining room weren’t featured, the show was about cleaning the barbecue-pit grease traps out back. Another important Jones County spot to visit is Griswoldville. There’s little to see but historical markers and a nearby Civil War battlefield. Sam Griswold built Georgia’s first “company town” near railroad tracks in the 1840s to support his industrial concerns, including making guns when the Confederacy needed them. His rare pistols today fetch $10,000 and up. From Macon, go right off Shurling Drive onto Griswoldville Road just after you enter Jones County. In fact, the first related marker is right there. Continue on to Hendersonville Road and you’ll see four markers. Biggest draw: Juliette and the Whistle Stop Café, 443 McCrackin St., Juliette, 478-992-8886, www.thewhistlestopcafe.com. Today, there really is a Whistle Stop Café in Juliette and you can get hand cut, lightly battered fried green tomatoes served with your choice of dipping sauce. You can also get a friend green tomato salad and a friend green tomato sandwich plus there’s plenty of other Southern-style fare to nourish the weary traveler not so fond of tomatoes. The Whistle Stop Café looks just like you’d think it should in its Depression-era story way and that’s part of the charm in visiting. Plus they have fried green tomatoes -- and sweet tea. The rest of Juliette, essentially a short stretch of narrow road, is lined with gift shops, craft shops, another spot to eat, the Juliette Opry and other interesting places all maintaining the Depression-era style, again, part of the charm. There’s also the Juliette Grist Mill built in 1927 looming in the sky at water’s edge. It once was the lifeblood of the community and has since been a motorcycle museum and a private residence. It’s empty now but impressive to stroll around without going in. Hike, swim, picnic, fish, canoe, camp and see the sights at High Falls State Park, www.gastateparks.org/HighFalls. In the early 1800s, the park area prospered with its own stores, blacksmiths, hotel, cotton gin, grist mill and even a shoe factory. See the old Tift College campus in Forsyth, on Tift College Drive. It was established in 1849 as a private liberal arts college for women and closed in 1898. It got its modern name from alumna Bessie Tift and is now the State Offices South at Tift College, housing various state agencies and headquartering the Georgia Department of Corrections. Take a drive or a walk through the Forsyth Commercial Historic District with its central Courthouse Square and see the Monroe County Historical Society Museum, open 9 a.m.-4 p.m. Wednesday-Friday at 126 E. Johnston St. There you can get an idea of the sights and heritage of Forsyth. Biggest draw: The Geographic Center of Georgia. Officially, it’s near the Jeffersonville/Bullard Road-Marion Road intersection, a half mile east of Interstate 16, Exit 18. Well, the Georgia Historical Marker is there. The marker itself states the geographic center is “one and one tenth mile south-southeast” of where it stands. This, supposedly, is indisputable. The Geologic Survey Branch of the Department of Natural Resources determined it. Other locations may claim to be the heart of Georgia, but Twiggs County and the once thriving community of Marion near the marker stand closer to the truth. To be technical, the marker says the center is latitude 32° 38’ 46” N., longitude 83° 25’ 54” W.
Marion was Twiggs’ first county seat, incorporated in 1816. According to another historical marker in the area, it was named for Gen. Francis Marion, the Revolutionary War general known as “Swamp Fox.” In Antebellum days, it was a prosperous trading center but nixed a railroad line passing through, which spelled its end, just as it did for many Georgia towns. See the Twiggs County Courthouse on North Railroad Street in the current county seat of Jeffersonville. Completed in 1903, it recently underwent a major renovation and expansion effort. See the Dudley Hughes home, called Magnolia Plantation, on the eastern outskirts of Danville on U.S. 80. Hughes was a member of Congress, a businessman with the Magnolia Orchard and the Georgia Fruit Land Company, a president of the Georgia Fruit Growers Association and a founder, director and president of the Macon, Dublin and Savannah Railroad. See historical markers and a monument at Griswold Battlefield, where Union and Confederate forces clashed during Sherman’s March to the Sea. Jones and Twiggs counties may argue where the battle took place, but the Georgia Department of Natural Resources says it was in Twiggs County. At the GriswoldvilleHendersonville Road intersection, jog right and turn left on Old Griswoldville Road. There’s an historical marker on the way to Baker Road, where you go left to the battlefield.